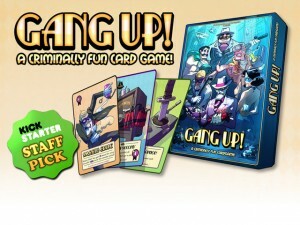 Gang Up is a new "criminally fun card game" that's up on Kickstarter and looking for some funding love. Gang Up! is casual card game where you compete to become the ultimate crime lord! Recruit legendary gang members and commit crazy daring crimes. Use criminal influences and team up with other players to get ahead. And when they least expect it, backstab them to win the game! What's so good about Gang Up!? -Constantly choose between helping or backstabbing friends! -Use weird card combos and advanced tactics! -Always influence the game, even when it's not your turn! -Never get stuck at last place; we put you back in the race! -An overload of crazy criminals & crimes! -Beautiful artwork, no shabby back alley illustrations here! And it's easy to learn & quick to play! Plays a bit like: 'Munchkin' or 'Magic'.